These Marabou Plumage are made from quality Marabou feathers. They are used all the time by the millenary industry. They are also suitable for trimmings and appliqués on just about anything from lamp shades to placemats even all the way to pocketbooks. 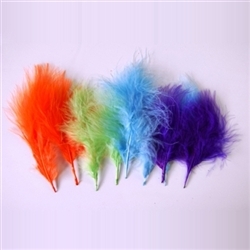 Instead of a whole boa whenever only a small cluster is needed, these individual turkey feathers are just what’s called for. Dyed Colors. They each stand approximately 4-6" inches tall. No mixing colors.